Seidenfadenia – a fantastic orchid! Sometimes you read about a plant in a book and it seems plain, one in a crowd. Then you see it in reality, and you are hopelessly in love. That was the case with Dendrobium albosanguineum, and my new crush is Seidenfadenia mitrata! The pink and white flowers just opened up. They are gorgeous, and so different from the entangled mass of aerial roots and greyish green string-like leaves. It is only known from Burma and Thailand. The Dokmai Garden specimen is a part of the Corien and Folbert Bronsema donation. How do you separate this species from any of the other 1100 Thai orchid species? To begin with, it is an epiphytic orchid, meaning it lives in the trees, not in the ground. Secondly, it has no pseudobulbs, i.e. swollen nutrient storage organs like in Bulbophyllum and so many Dendrobium. Thirdly, the leaves are not flat, and they are not cylindrical (terete), they are cylindrical with a longitudinal groove – very special! The leaves hang down like strings. One leaf of the Dokmai Garden specimen is 88 cm long and 4 mm broad. Fourthly, the flowers have a spur, and fifthly, the spur is pointed forward! The lip is flat like a chin and very stiff, like a concrete landing platform for pollinating insects. With this combination of characters it should be easy to identify it. What about its scientific name Seidenfadenia? The name honours the Danish diplomat and orchid specialist Gunnar Seidenfaden (1908-2001). He was the Danish ambasador in Thailand in 1955-1959, and he arranged several expeditions in 1956-1984. He described over 120 new orchid species from Southeast Asia. This species was originally described as Aerides mitrata in 1864 by Heinrich Gustav Reichenbach but was transferred to the new genus Seidenfadenia by Leslie Andrew Garay in 1972. Would you like to become immortal by lending your name to a new plant species? Make a significant donation to the Orchid Ark and you shall be remembered for ever. We can not promise your name will be latinised for a new orchid species, but there are many other new plant species described from Thailand. Anyone who significantly contributes to their survival deserves recognition. Although claimed to be fairly common in the evergreen forests of northern Thailand, I have never seen Seidenfadenia mitrata in the wild, so I guess it was common a few decades ago. This native orchid will be pollinated within the Orchid Ark program. You can help it survive! Profile. 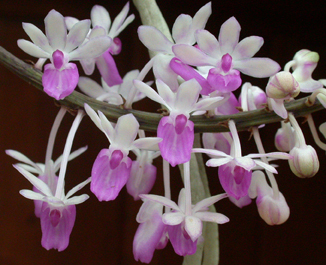 The crest at the apex of the column differentiates it from the genus Aerides. 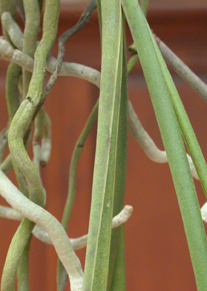 The worm-like structures are aerial roots. Then there are three leaves seen. The leaf to the left displays its characteristic longitudinal groove. Such leaves might be found in the genus Holcoglossum too, but the spurs of their flowers are pointed backwards.